A feverish disease (now understood to be caused by an infection in most cases) damages the nutritive essences that supply the muscles and tendons. Spiritual exhaustion reduces the communication between the mind and body, affecting sensation, movement, and mental clarity. Adverse dietary factors can lead to weakness of muscles and laxness of tendons, and they can exacerbate deficiency of essence. In TCM, one of the primary functions of the spleen and stomach are transforming food into nutrient essence that is used to manufacture qi and blood. Under-functioning will lead to malabsorption and indigestion, and dampness or phlegm will accumulate. When dampness or phlegm interferes with the ascending movement of yang-qi to the head region, vertigo occurs. On the other hand, due to the impairment in the transformation of blood and qi, head orifices and the sea of marrow will lose nourishment, leading to the development of speech difficulties or visual problems. When there are inadequate nutrients to bones, muscles, and tendons, associated symptoms appear. Improper diet is a possible cause of these symptoms. This invasion is contracted by living in damp places, sitting on damp grass, failing to dry oneself after swimming, being exposed to damp weather when wearing inadequate clothing or being exposed to foggy weather. The dampness evil tends to invade the meridians in the limbs; they cause obstruction and lead to heaviness, numbness and tingling sensations. When the damp circumstances last for a long time or are repeated, the accumulated dampness evil can turn into internal heat, which will then cause further damage to the organs, and result in various symptoms. Typically, the lung is responsible for distributing the nutrient essence throughout the body; this distribution function is carried by the lung fluid, which works to nourish the muscles, tendons, bones, and vessels and also acts as the material base for normal functioning of the other organs. Acute febrile disease caused by exogenous evils invasion, e.g., wind, heat, or coldness, usually damage the lung and lead to lung fluid being consumed and therefore depleted. Sometimes, a heated lung can also be induced by excessive internal heat and dryness evils. Depletion of lung fluid leads to insufficient nourishment in the above-mentioned structures and result in related manifestations. 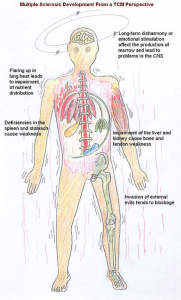 In TCM, liver stores blood and rules tendons, and kidney stores essence and rules bones. Having a long-term chronic disease, being sexually active, overstraining oneself, suffering from an emotional disturbance or accumulation of damp-heat evils in the lower burner lead to liver and kidney damage. This damage leads to a depletion of kidney essence. As a result, there is inadequate supply to the bones, tendons, and meridians, leading to the development of multiple sclerosis. LeTa Jussila and her business partner Lee Holden are gifting you with a free 20 minute and 75-minute Qi Gong Flow class. 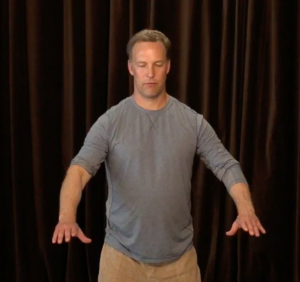 It’s pre-recorded so click here (or on the Qi Gong photo) and scroll down until you see the FREE Class offered. They offer classes at their clinic in downtown Santa Cruz as well as live-streamed and replay if you can’t make it.